Fall is upon us, and like the arrival of spring, the change of season brings renewed energy and a desire for change. 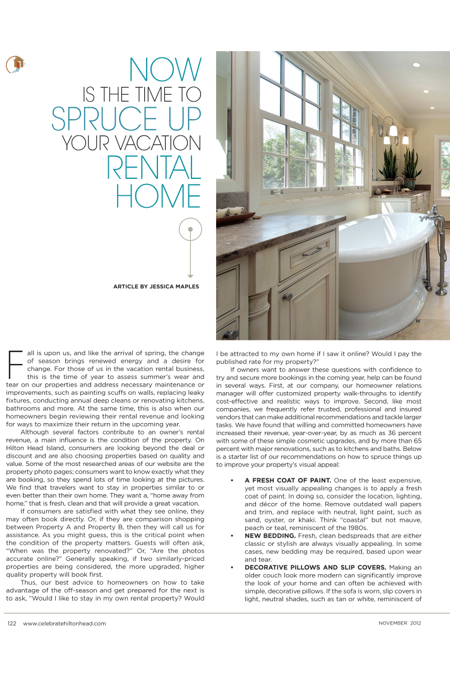 For those of us in the vacation rental business, this is the time of year to assess summer’s wear and tear on our properties and address necessary maintenance or improvements, such as painting scuffs on walls, replacing leaky fixtures, conducting annual deep cleans or renovating kitchens, bathrooms and more. At the same time, this is also when our homeowners begin reviewing their rental revenue and looking for ways to maximize their return in the upcoming year. Although several factors contribute to an owner’s rental revenue, a main influence is the condition of the property. On Hilton Head Island, consumers are looking beyond the deal or discount and are also choosing properties based on quality and value. Some of the most researched areas of our website are the property photo pages; consumers want to know exactly what they are booking, so they spend lots of time looking at the pictures. We find that travelers want to stay in properties similar to or even better than their own home. They want a, “home away from home,” that is fresh, clean and that will provide a great vacation. If consumers are satisfied with what they see online, they may often book directly. Or, if they are comparison shopping between Property A and Property B, then they will call us for assistance. As you might guess, this is the critical point when the condition of the property matters. Guests will often ask, “When was the property renovated?” Or, “Are the photos accurate online?” Generally speaking, if two similarly-priced properties are being considered, the more upgraded, higher quality property will book first. A fresh coat of paint. One of the least expensive, yet most visually appealing changes is to apply a fresh coat of paint. In doing so, consider the location, lighting, and décor of the home. Remove outdated wall papers and trim, and replace with neutral, light paint, such as sand, oyster, or khaki. Think “coastal” but not mauve, peach or teal, reminiscent of the 1980s. New bedding. Fresh, clean bedspreads that are either classic or stylish are always visually appealing. In some cases, new bedding may be required, based upon wear and tear. Decorative pillows and slip covers. Making an older couch look more modern can significantly improve the look of your home and can often be achieved with simple, decorative pillows. If the sofa is worn, slip covers in light, neutral shades, such as tan or white, reminiscent of the beach, will freshen things up and are laundered easily. Flat screen TVs and wireless Internet. If your property doesn’t already have these items, invest in them right away. A most-often-asked question of our reservation team is regarding technology. Guests want the best screens and highest-connectivity feasible, even while on vacation. When these resources aren’t available, a property can easily lose a sale. New window treatments. You can’t underestimate the value of natural light in island-setting home. The more sunlight available, the more airy and welcoming the feel. We recommend removing outdated valances or drapery and replacing with more trend-setting blinds, rods and curtains. Such changes will immediately impact the visual appeal of the home. Kitchens and baths. According to the 2012 Cost vs. Value report of Remodeling magazine, kitchens are still one of the top ten ways to spend your money when upgrading a home. For consumers, according to a recently released survey by Wyndham Worldwide, our parent company, one of the top reasons a consumer would choose a vacation rental over a traditional hotel room is for the kitchen. Travelers and families love their kitchens and find that they are an integral part of their stay. Flooring. First impressions matter, thus the first step into your home should be a good one. New carpet or other solid, sturdy flooring is a “homerun” renovation. Everywhere guests relax in your home will be that much more satisfying with new floors. Jessica Maples is marketing manager for ResortQuest by Wyndham Vacation Rentals on Hilton Head Island.